The president of Uganda H.E Yoweri Museveni recently commissioned the newly completed Kampala-Entebbe Expressway that connects the Entebbe International Airport to the greater Kampala metropolitan area. This 51.4km highway was constructed with $350m loan from Exim Bank of China and the Chinese construction company (China Communications Construction Company was in charge of the road construction while the Beijing Expressway Supervision administered the project. Among the various advantages and solutions it comes with, the new expressway is expected to quicken the transportation of different visitors to Uganda. These include diplomats that come for different purposes and tourists that come for various Uganda wildlife safaris who have been getting stuck in the intense traffic along the old Kampala-Entebbe Road before they get to their exact destinations. There has also been a big risk of travelers missing out on their flights after getting delayed in traffic along the way from Kampala a problem expected to be solved by the new route. The opening of the Entebbe express way s good news especially for travel operators in Uganda. The highway is hoped to make transport much easier and quick for travelers connecting to far places especially for gorilla safaris in Bwindi/Mgahinga gorilla national park. The high way help travelers to dodge the traffic jam in kampala city saving them of time and too much fuel spent in Jam. The Uganda National Roads Authority (UNRA) hopes that the four-lane carriageway will ease congestion in the central business district and it will also create a link between the Airport and the areas of interest along the shores of Lake Victoria including the Lake Victoria Serena Golf Resort and Spa which is in the final stages of the development of its second nine –hole golf course. The Entebbe Expressway starts at Entebbe International Airport and continues to Mpala, then go through Akright estate, Kajjansi, Kabojja and then it joins the Kampala Northern Bypass Highway at Busega. This is the main straight route of the highway and it covers a distance of approximately 37.23km whereas there is a spur branching off the highway at Kajjansi to link to Munyonyo along the Northern shores of Lake Victoria and this covers 14.13km. The new expressway is a toll-road and vehicles intending to use it will need electronic billing devices. However, despite its limited access status, the new expressway will hugely assist the old-fashioned Kampala-Entebbe Road in handling traffic given that the latter is narrow, congested and poorly situated to handle the heavy traffic it faces currently. 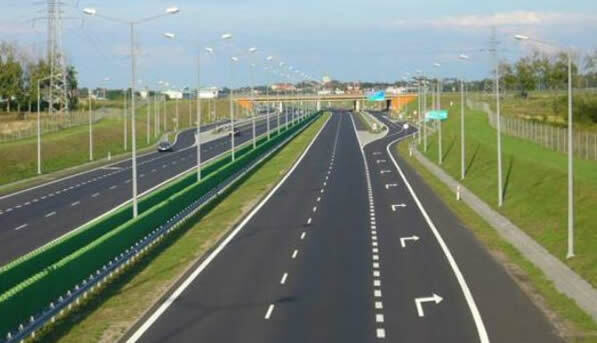 The total cost of the road was USD476 million and apart from the USD350 loan from the Exim Bank of China that also attracted a 2% annual interest, the remaining USD126 million was provided by the Government Of Uganda. The government also incurred further UGX 123 billion to compensate the residents who had land along the route. However, those who are excited about using the road will have to wait up to November this year when the installation of toll-paying technology at the payment booths and the passage of the law authorizing the building and use of toll roads is expected to be finalized. Following the completion of the Entebbe Expressway, the UNRA has also opened the bidding process for the construction of another highway linking Kampala to the industrial city of Jinja which is expected to become a key link in transport routes to East Africa.